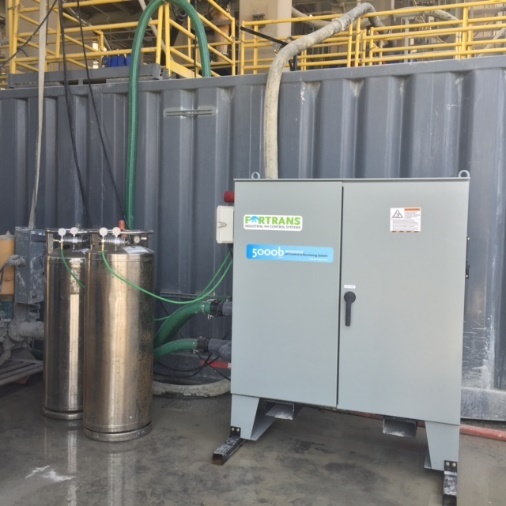 Fortrans, Inc.® offers a full range of innovative pH control solutions for a wide array of applications, including industrial process water treatment. Our pH control systems use our proprietary, patented Dif-Jet technology to dissolve carbon dioxide (CO2) into high-pH water for easy, cost-effective, and environmentally-friendly pH control. Unlike other pH control systems on the market, our systems are highly reliable, easy to maintain, affordable to operate, and cannot become clogged or fouled by scale or other dissolved solids. Read below for more information about our trusted pH control systems. 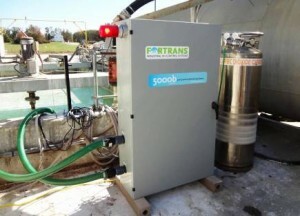 The Fortrans Model 5000B pH control system uses patented Dif-Jet carbon dioxide gas injectors to lower and maintain target pH automatically in tanks, basins, wastewater lagoons, and stormwater ponds. Dif-jet gas injectors dissolve over 90% of C0₂ gas into water. The package system delivers thorough mixing and circulation of treated water. Dif-jet gas injectors do not foul or clog in operation, allowing pH adjustment of high-solids wastewater. The system is enclosed in a weatherproof panel assembly for outdoor or indoor use. The standard 5000B will treat basins, lagoon, tanks, and ponds containing up to 2 million gallons. This pH control system treats at a rate of 65 to 75 GPM with integral centrifugal pump or submersible pump. 5000B systems can be equipped to handle capacity to 150 or 230 GPM with appropriately sized circulation pumps and additional gas injectors to treat containment to 8 to 10 Million gallons. 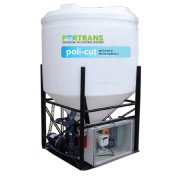 The Fortrans Poli-Cut unit is a portable or stationary pH control system that includes a 200 gallon treatment tank with and overall height of 71″. This pH control system can be transported in standard construction trailers. The system includes the Dif-Jet C0₂ gas injector along with a NEMA 4X panel to house the instrumentation. The system is 71″ high and can be loaded into construction trailers for on-site treatment. The Poli-Cut includes a cone-shaped bottom tank with valve for easy clean out. Poli-Cut systems can batch treat or be configured for continuous treatment with an overflow to discharge. 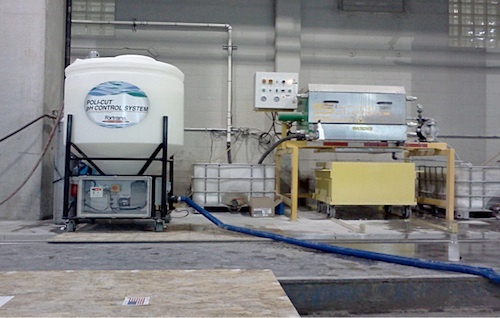 This pH control system can treat 75 to 100 GPM of incoming high-pH water. 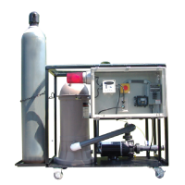 The Fortrans Model 5000SP is a small, portable pH control system capable of treating and circulating 65 to 75 GPM of high-pH water in containment such as tanks, basins ponds, and other similar applications. The system can be equipped with integral wet head centrifugal or submersible pumps. The unit is designed for easier transport to various sites for spot treatment. The new Fortrans 6000 series is a line of high-capacity pH control systems that can inject up to 120 pounds of carbon dioxide gas per hour into water contained in basins or holding tanks or even water flowing in pipes. 6000 series equipment includes powerful automation technology, and these systems are housed in high-quality NEMA 4X panels for long-lasting performance.